Hello everyone! Casey here. I'm sharing an interview with Sheila O'Connor today. Her middle grade debut, Sparrow Road, releases tomorrow and it sounds truly fantastic. Kirkus confirmed my suspicions in giving the title a starred review! It's the summer before seventh grade, and twelve-year- old Raine O’Rourke's mother suddenly takes a job hours from home at mysterious Sparrow Road– a creepy, dilapidated mansion that houses an eccentric group of artists. As Raine tries to make sense of her new surroundings, she forges friendships with a cast of quirky characters including the outrageous and funky Josie. Together, Raine and Josie decide to solve the mysteries of Sparrow Road–from its haunting history as an orphanage to the secrets of its silent, brooding owner, Viktor. But it's an unexpected secret from Raine's own life that changes her forever. 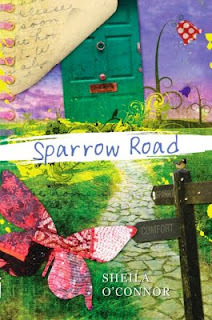 An affecting and beautifully written story of family and forgiveness, Sparrow Road is an incredible gift. To celebrate Sheila's release day tomorrow I'm buying a copy for one lucky commenter (when I order one for me!). Please read the following interview and see the details below for your chance to win. Hi Sheila! We're so happy to have you on Literary Rambles today. Can you start things off by telling us a little about yourself and your books? With the release of Sparrow Road, I finally get to think of myself as a writer for readers of all ages. My first two books were strictly for adults, although teens did read them. I hope Sparrow Road is a book for everyone. I have to tell you, after reading the summary and advanced praise on your website for Sparrow Road, I’m dying to read it. It sounds delicious! What was the seed of the story? How did it evolve? I was a resident at the Anderson Center, an artist colony in Red Wing, Minnesota. I had spent an amazing month in the company of artists full of good will and creativity, and one afternoon I looked out my window and thought: What if a child came to live at a place like this? What a lucky thing that would be. A few years passed, and one day I sat down to begin a book—with no real idea of what that book would be—and Sparrow Road was born. Well, you ended up with something great! The premise is amazing. With everything the story has to offer, what do you most hope your young fans take away from the tale? For me, Sparrow Road is a testament to the power of imagination and the many ways in which the creative process empowers and heals. I hope readers of all ages see themselves as creators—whether they’re daydreamers, or quilters, or musicians, or painters. It’s also a book about hope and generosity—how deep our goodness runs. What a fantastic message. I think creativity in every sense is empowering for children (and adults! ), too. You describe a fun, somewhat nontraditional childhood in your website bio. How much of your early years influenced your writing? You’re right, it was a non-traditional childhood and I think all the books I’ve written mirror that in some way—in part because I wished I’d seen my own life reflected in literature when I was young. It’s important to me that my fiction tells the truth of children’s lives—so my characters live in divorced families, and blended families, foster families, single-parent families, and traditional families. All of those are real and true—and all offer their own challenges and gifts. Are there any anecdotes or hidden gems in Sparrow Road or your other books readers might find interesting? That’s a great question. One very astute third grade boy recently told me that he thought Sparrow Road was really a book about imagining a book—and he was totally right! I was floored when he said it because I thought it was my own secret intention, but there he was at nine years old, discovering it between the lines. Of course, kids are brilliant. What a great story. Kids are amazingly perceptive. Do you have a favorite quote or scene from the book you'd like to share or talk about? Oh, that’s a tough one. Early in the book, one of the artists Diego Garcia encourages Raine to think about the good that comes from spending every day in silence. (Everyone at Sparrow Road must stay silent until supper.) He says to Raine, “Ask yourself, What if? Or think about what was or what could be. And suddenly like magic, you’ll be drifting in a dream.” That’s the enchantment of Sparrow Road—all the wonder that waits ahead. I’ve spent the last twenty years or so as a poet-in-the-schools, encouraging young people to honor their hearts, trust their imaginations, and put their dreams to paper. So I’m happy to hear Diego give such sage advice. Sage advice, indeed. It sounds like Sparrow Road has a lot to offer readers. Everyone’s putting a lot of importance on self-promotion these days. What is your stance? How has the marketing and promotion side of publication been for you so far? Well in truth, I’m happy just to write, and I’m happy teaching writing to my graduate students and to young people. That feels like part of the work I’m on this earth to do; I’m not sure I was put here to do self-promotion. And yet it’s true, the work of spreading the news of the book falls to authors these days, and so we must. Recently, when Sparrow Road got a starred review in Kirkus, I was thrilled to share that news with friends—which in this day and age meant posting it on the internet. With my previous books, it meant a cake at supper. Now, it’s all so much more public. Everything. And the book business just reflects that. We don’t much live in private anymore. My first job is to write the best book I can, because without that, there’s not good news to share. In the end, I believe books live in the hearts of readers, so I am most at home connecting personally with readers through book clubs, libraries, schools etc. This to me is good work, and while it may promote the book, it doesn’t feel like self-promotion, it feels like community. I love your approach, Sheila. It sounds like you've found a good balance. Keep putting your books first - we want to read them! What is your writing process like? How do you stay on task and motivated? I’m a fulltime professor in a MFA program, so writing time is scarce for me. For that reason, I have to be disciplined about my work. I learned long ago that a novel requires hours and attention, so when I have a book in-progress, I write seven days a week, for four to five hours a day. Sometimes more. And I don’t allow myself to quit until I’ve put in the hours. After a few years (or many years) of keeping that commitment, I’ll finally have a book. What amazing commitment! You're an inspiration for working writers everywhere. Can you divulge anything about your current work-in-progress? I have a new book forthcoming from Putnam in fall 2012 tentatively titled Keeping Safe the Stars. It’s a tale of three very spunky, delightful free-thinking siblings all of whom have incredibly great spirits. I am deeply in love with the Star children and hope the world will make a home for them. Oh, I can't wait to meet the Star children. They do sound delightful. Where can readers stay up-to-date on the latest and greatest on you and your books? I wish I had something snazzy like the Bronte museum to offer readers, a place where you could come and see childhood trinkets and little tiny white gloves, but instead I have my author facebook page. It’s free, it’s open to the public, anyone can visit, so I hope you will stop by. Leave a note. I love to hear from readers. http://www.facebook.com/pages/Minneapolis-MN/Sheila-OConnor/178586645491731. I I also have a website www.sheilaoconnor.com. The photo of the girl with the baseball mitt is me. That photo is fantastic (and I love your website). Last question! What’s one interview question you haven’t been asked and wish you would be? And please, answer it! What’s been the best part of publication so far? So glad you asked! The best part so far has been the day I spent with some third and fourth grade students. Their teacher, Mrs. Gainey, had read them an advanced copy of Sparrow Road and the kids had so many smart things to say about the book, so many insightful observations. One boy raised his hand and said—“Reading Sparrow Road made me want to write my own book.” That was a dream fulfilled. That does sound like a truly fantastic experience. Thank you so much for the interview, Sheila. I wish you and Sparrow Road the very best. I expect great things! Readers, if you'd like to enter for a chance to win Sparrow Road simply leave a comment with your e-mail address (if it's hard to find) by Tuesday 5/17 midnight. If you spread the word about the interview in some way and/or are likely to review the title if you win, let me know and I'll give you an extra point or two (honor system). I'll announce the winner 5/18. Good luck! I don't normally read middle grade, but this one sounds like a good one to pick up. Sheila also seems like a truly lovely person. Great interview! I'm excited to read this. Great interview and love the cover. Not only can't wait to read Sparrow Road but also very eager to read Keeping Safe the Stars! Great interview. I've heard of this book and was intrigued. And Sheila, I love that you try to write about kids in all walks of life. Can't wait to read this. This sounds like a wonderful and unique novel! I'm looking forward to reading it. Please don't enter me; I'm waiting for my copy to arrive. I also have a copy in the mail from my pre order ... but just had to pop in and say CONGRATS Sheila! Sounds like such a great story. And I love the cover! Sheila taught my 3rd grader poetry last week! The book sounds amazing. Great interview too! Sounds like a terrific book. I like the idea of revealing things at a leisurely pace. Fantastic interview, Casey! And I love this book. When I read the ARC and blogged about it, I realized this is exactly the kind of book I would have cherished as a 10 year old. And congrats, Sheila, on the starred review from Kirkus! Can't wait to read your next book. Already have a copy -- so don't include me in the giveaway. My email is super easy to find, so I'll just mention that I facebook shared this. The setting sounds incredible. Can't wait to read it! Very intriguing concept. I look forward to sharing this one with my daughter. Thanks for a great interview. What a surprise and joy to come upon so may thoughtful comments. Wow. Victoria, I don't know if Sparrow Road will help your niece come to acceptance, but it is a book about acceptance among many other things. And the orphans and their stories matter deeply to Raine. (And me as well.) I always think it's important to see our lives in literature--in whatever small way it mirrors how we feel in our hearts. There are readers who will relate to Raine and readers who will learn from her. One of the great gifts of fiction. If any of you happen to read it, or know young people who read it, send word to my author fb page. Let me know your thoughts. 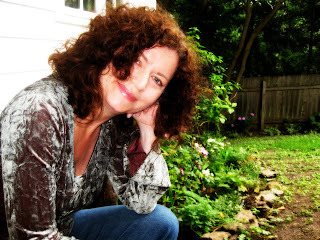 I have watched Sheila teach poetry and found myself entranced by her magic way of getting kids and adults to write things they didn't think they knew. Sparrow Road is surely a collage of all those moments of teaching, all those amazing things Sheila helped kids realize, and the way she listened to their words, soaking up their wisdom. What if we woke up to embrace each new day for whatever it reveals? What if we were silent for a day? What if we forgave more easily? My student Marley loves Sparrow Road-it is her new favorite book. In a few hours, it will be a favorite to any more. I like hearing you say you love the Star children. It makes me want to read about them. I love my characters and as a writer that helps keep me working my hardest. Sounds like a great read for my 9 year old and me! kristinbartleylenz at gmail dot com. The story sounds amazing, new, and full of heart and hope. Can't wait to read. The story sounds every bit as incredible as the cover, which I have officially fallen in love with, looks.